So after hearing several colleagues at work and friends saying this place called ‘Pho’ (pronounced ‘foe’) was somewhere I should definitely try as a foodie, I thought I’d look into it a little more by checking out the Pho Oxford Menu. I was a bit sceptical at first but I’m always keen to try new cuisines, admittedly I had never tried Vietnamese style food until this point. After looking at the Pho menu online, I thought it certainly looked promising with a decent selection of Asian dishes, some of which I never knew existed. Also, I love spicy food so thought this might be a good place to test out my food spiciness threshold. When we visited, we specifically tried their Christmas Party Menu which can be found here. The first Pho restaurant was opened by Stephen and Juliette Wall in June 2005 after they travelled to Vietnam and fell in love with the food. ‘Pho’ is actually a dish in Vietnam, mainly a soup with noodles and meat and is pronounced ‘Fuh’. So to begin with we had BÁNH PHỒNG TÔM (Prawn crackers with sweet chilli sauce) and I can’t convey enough through words how moreish they were. I think the entire bowl lasted about 2 minutes. This was quite nice and felt like an Asian style equivalent to having your bread and butter before a meal in a pub. 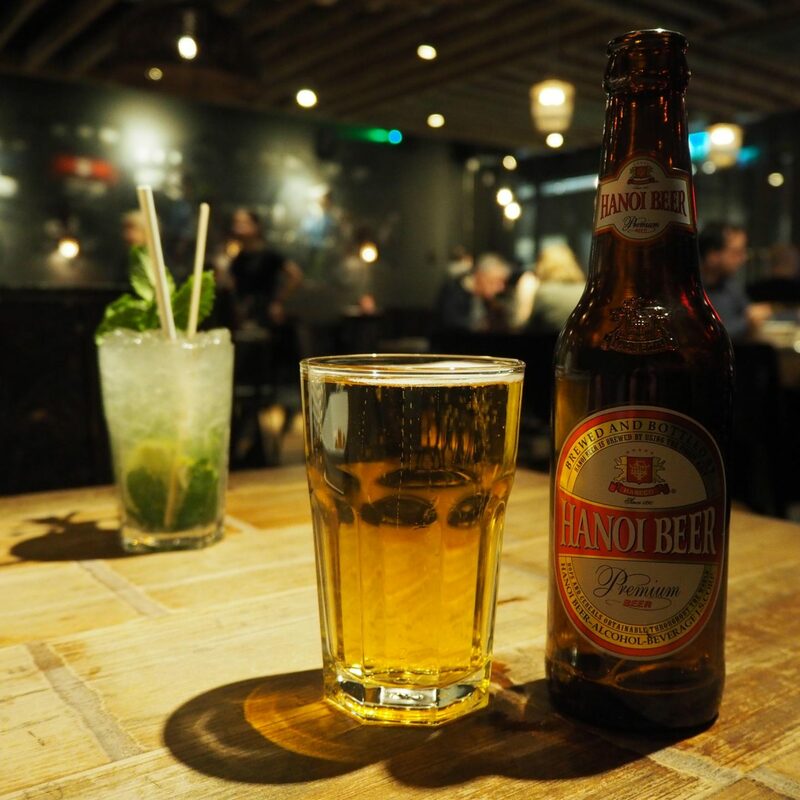 To drink, I opted for a Hanoi Beer. They did not have any beers on draft which was slightly disappointing however I really enjoyed this, recommended by our waitress. The beer wasn’t too heavy but was still tasty. Below is one of Pho’s speciality cocktails, a ‘Phojito’ consisting of Nếp Phú Lộc (clear rice spirit), mint, lime & soda. This tastes similar to your standard Mojito but has a slight twist to it, most likely the rice spirit. It was really tasty, cleansed the pallet nicely and would definitely recommend trying it. 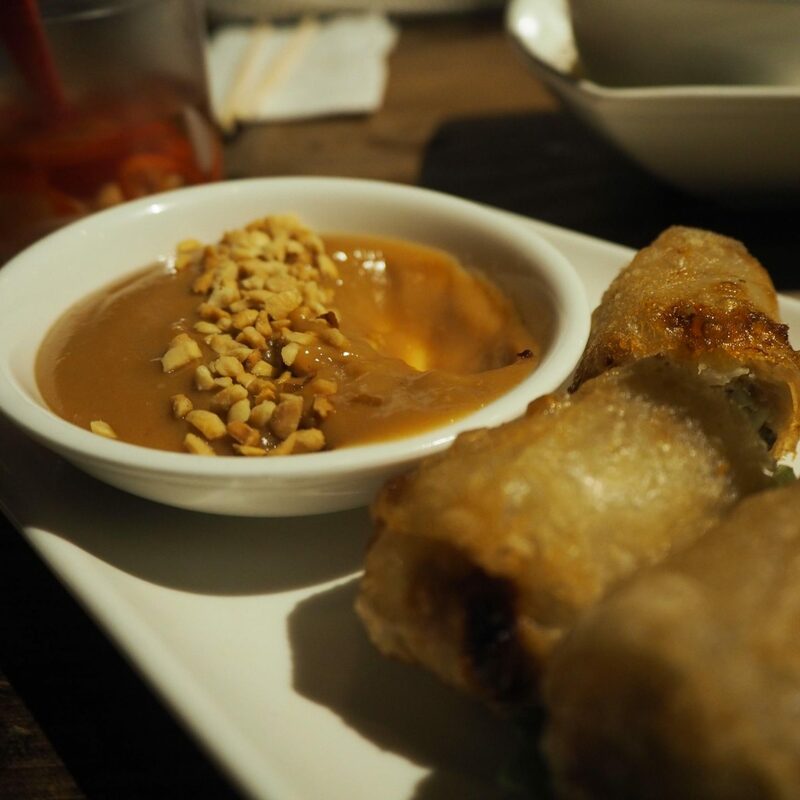 I’ve tried many spring rolls in the past, some from questionable Chinese takeaways and others from nice Asian restaurant but hands down I have to say these are the nicest spring rolls I’ve ever eaten. Maybe because there is more meat in them or the quality of pork is higher than your typical roll, but seriously, just look at the inside of them above. They’re super filling and tasty. The Squid was lovely, although the sauce was not something I would choose to have again. We were told by our waitress that you are meant to squeeze the lime in and stir, to create a hot dipping sauce. I still felt that after squeezing the entire lime the sauce was a bit lumpy and tasted a bit like bicarbonate of soda with a spicy kick. However, the squid pieces were really tender and lovely. 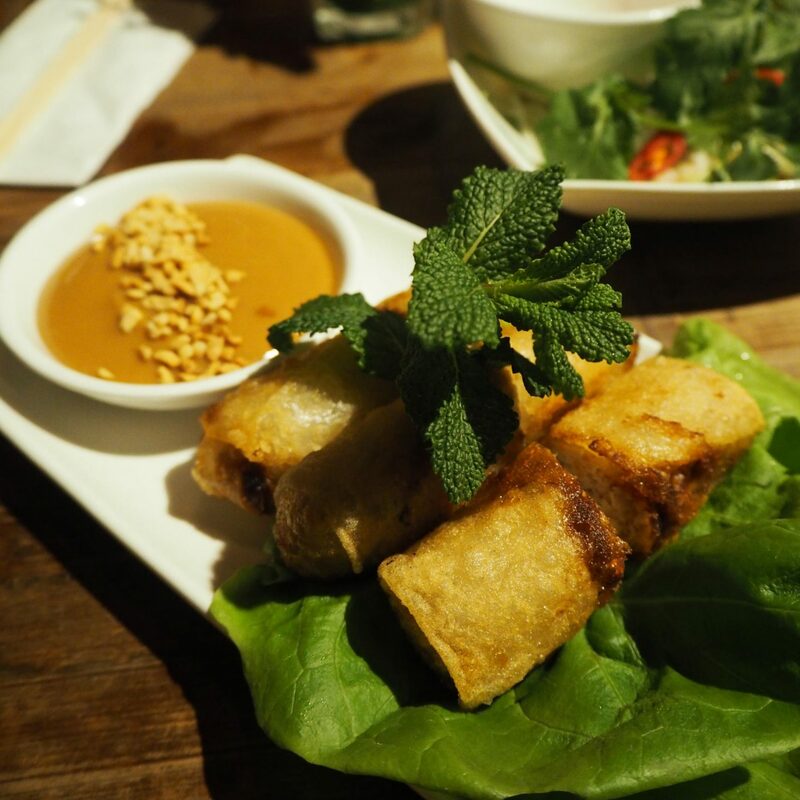 Going back to the spring roll, what was quite interesting was that there is a particular method they encourage you to follow when eating these. 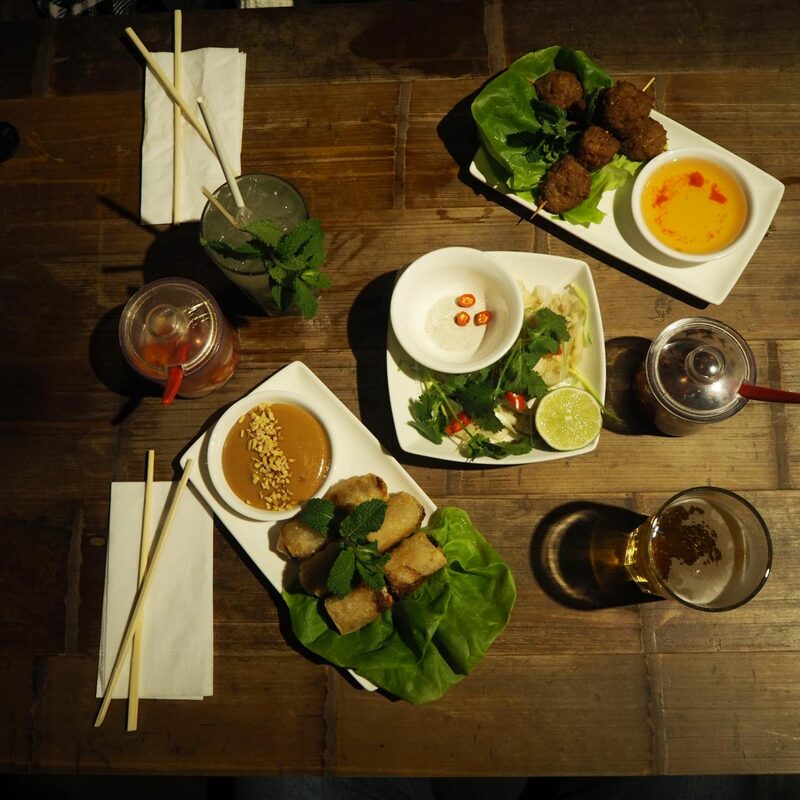 They suggest you wrap the spring roll in the leaf, add some fresh mint and whichever sauce you have chosen, which was Peanut sauce in our case and then wrap up and eat. I have to say this did add to the consistency and flavour and was nice to try. And a selection of sharing side dishes which were: Wok-fried Chinese leaf in soy sauce, Green beans & sugar snaps in peanut dressing, Stir fried morning glory in garlic. So my main was the Vietnamese curry. I absolutely loved it. If I had to describe how it tasted I would say it is like a combination of Katsu curry, Satay Sauce and Thai Green curry (all of which I really like) so this went down really well. We thought the other main was a very good basic stir fry and couldn’t think of anything to say against it, but it didn’t particularly wow us either. 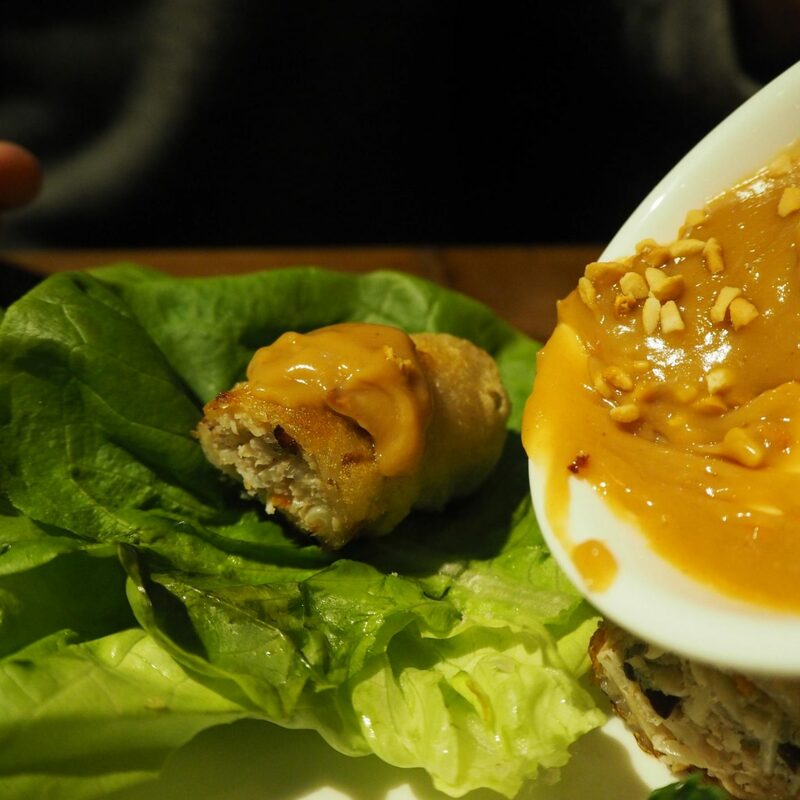 The sides were fantastic (especially as we had more of that amazing Peanut sauce). Our least favourite out of the three was the wok-fried Chinese leaf in soy sauce but the green beans and sugar snaps as well as the stir fried morning glory in garlic tasted so fresh and complimented our meals well. At this point we were admittedly stuffed and I wanted to try a non-alcoholic drink that was unique to Pho. Our waitress recommended the Lime and Chilli spritzer you can see below. 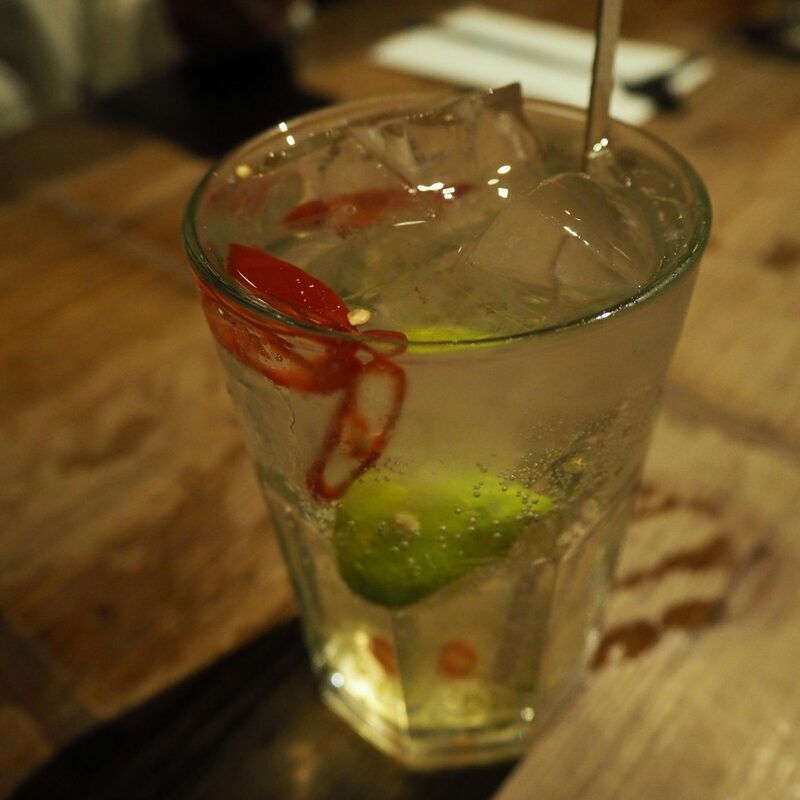 As mentioned before – I really love spicy foods and couldn’t turn down a drink that had fresh chilli in it. This has to be one of the most refreshing drinks I’ve had and can imagine this would be incredible on a hot day – if only I visited a few months ago to try it. You have to give it a good stir because the chilli seeds drop to the bottom. Chuối chiên: banana fritter with ice cream. BÁNH KẸP LÁ DỮA: Freshly cooked Pandan waffle served with ice cream or sorbet. As both of us are coconut lovers we decided to go for Pho’s coconut ice cream with both of our desserts. The banana fritter was amazing and the perfect portion for a dessert in my opinion as any more would have been a bit sickly. The Pandan waffle was interesting. The texture was very much like a wafer opposed to a waffle but presentation and taste was perfect. My conclusion for Pho Oxford is that if you want to go out and enjoy a nice Asian meal and would like to experiment by trying some foods/drinks that might not typically be on your local Chinese restaurants menu, then visit. For me the quality of food and level of presentation was high, and the service was nothing short of amazing. I particularly noticed that the staff knew the menu very well and recommended things that they enjoyed eating and drinking themselves which was a nice touch, that confidence in a restaurants menu is not commonly seen with waiters and waitresses in my opinion. I noticed that Pho Oxford brought in a mixed crowd, both younger and older people, couples and families so I think its a place anyone could enjoy a meal. Also I wanted to say a big thank you to Chloe and Justina who looked after us both incredibly well as well as making some great suggestions on what to try from the menu – if you have them as waitresses I’m sure you’ll be looked after well. If you’d like to, you can check out more of our food and drinks reviews in Oxford here.